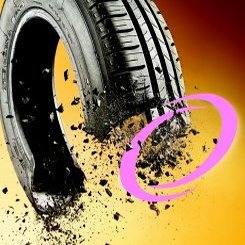 Due to the increasing number of cars and trucks all over the world, used tyres are available in large quantities at very low cost. With a bit of clever recycling, you can get a whole lot out of used tyres: granule in various sizes, steel and profit. The sales income naturally depends on the quality of the output material a process that is as efficient as possible. ZERMA designed a system dedicated to tyre recycling, which ultimately produces very high-quality materials for recycling. Final products could be either shreds for thermal recycling, predominantly in the cement industry and crumb rubber of about 5 mm size used in various applications. The first step is the newly developed ZERMA ZTTS Tyre shredder which can shred passenger car tyres of up to � 800mm into strips and pieces of approx. 150 mm � 300 mm. ZERMA tyre shredders are heavy duty single shaft shredders with gravity infeed specifically designed for the grinding of tyres. They feature additional wear protection compared to other shredders. The machine is equipped with a flat rotor, made of highly wear resistant steel with added weld on hard facing for longer lifetime. The cutters used in these shredders are made from a newly designed, specialized material to ensure long life time and optimal performance. As opposed to other systems, the ZERMA system does not require the tyres to be de-beaded. For larger truck tyres we modified our proven ZXS Shredder. The so called ZXS �T� can shred truck tyres of up to � 1500 mm into shreds of approx. 150mm � 300 mm. In both cases these shreds are discharged by a conveyor belt and transferred to the next ZTTS second stage tyre shredder. This shredder is than shredding the material into pieces of about 20 mm. This step helps to separate the tyre rubber from the steel. A combination of cross belt magnetic separators and magnetic drums helps to split the various factions at this stage in the process. During metal separation we can take out about 99% of the total steel content. The steel free granule can than be packed and used as refuse derived fuel or transferred to the granulating process. After shredding and steel separation the tyre shreds will be transferred to the granulation process. For granulating of the rubber shreds we are using our heavy duty GSH granulators with a special closed H-rotor to reduce the rubber down to a size of < 5mm in two steps. Throughout this process the material is classified on ZERMA CS screening machines and the last metal contamination is eliminated by additional magnetic drums. The ZTTS is used to pre shred complete car tyres or large chunks of pre processed tyres down to a size of about 150 mm. The twin rows of stator knives and screen in the ZTTS enable it to take the tyre shreds down to a any required size > 20 mm. The unique machine design combined with the variable cutting gap create an optimal separation of rubber and steel fractions.